Tucked on an island playground in expansive Lake Lanier, the gorgeous resort is the perfect destination for a wonderful golf experience and more. Located north-east of the city, this man-made lake is abuzz with people seeking recreation on the waves and shorelines of the reservoir. 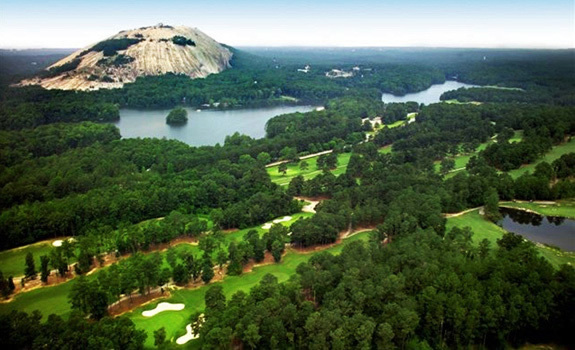 The Legacy Course, playing from 4852 to 6580 yards, utilizes the natural fingers of the lake presenting wildly challenging and breathtaking holes. This Billy Fuller layout starts with a gentle par 5 ending at a greensite with a beautiful view of the lake foreshadowing what is in store. 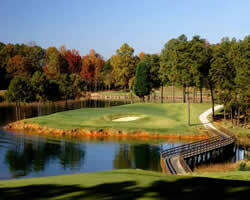 The first 6 holes play along and over the meandering shoreline. The course tempts you with how much to cut off to avoid a watery ending to your shots. Tight landing areas with well guarded green-sites makes this opening stretch of holes memorable and a stern test right out of the blocks. The water comes back into full force on the point after the 11th green. Holes 12 - 14 all require nerves of steel and a pure stroke to deal with the impending liquid doom. 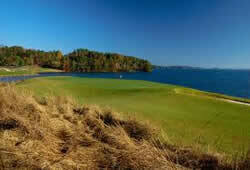 Beautiful vistas, challenging holes, elevation changes and forced carries make this a must play in the area. Combine a visit to the Legacy with a stay at the Lodge and make your getaway featuring a charming setting filled with numerous activities both adventurous and relaxing pending your tastes. Park you car at the resort and enjoy everything the resort has to offer, Boating, horseback riding, ziplining, biking and hiking are just some of the many other things to enjoy while at the resort. Or if relaxing is more to your liking a trip to the spa or a fine meal at the on-site restaurants will make your stay at Lake Lanier Islands Resort memorable.